Matching our New Baby Boy greetings card, this kit includes charted alphabets and numbers to help you devise the names and birth dates of your new baby boy. 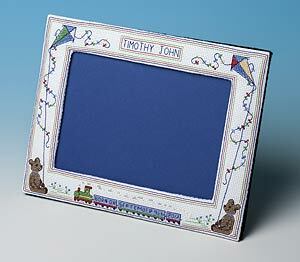 The frame stands 19 cms high and 24 cms wide and the kit contains 14-count aida, stranded cotton, pre-cut plastic canvas, wadding, felt, needle, chart, full instructions and a piece of dark blue mounting card for the picture. The kit would make a delightful gift for new parents.